Forbes has released a list of YouTube's top-earning stars, taking into account their video advertising profits, merchandise deals and other sources of revenue. 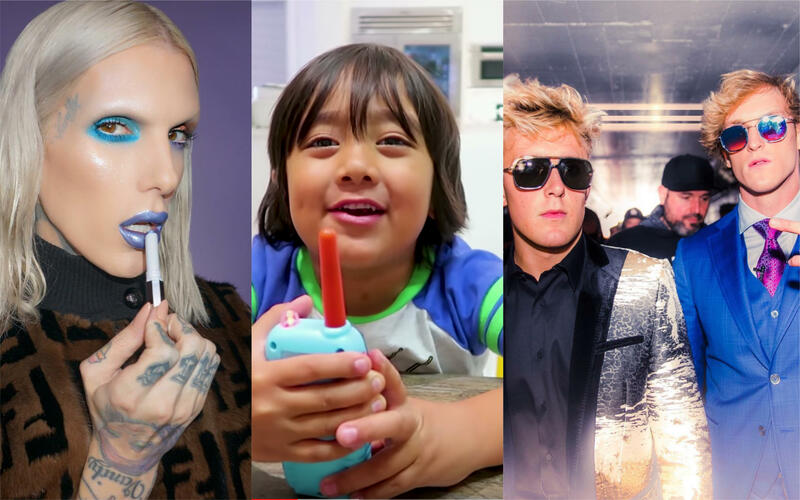 From controversial brothers to a toy-loving 7-year-old boy, here is the list of highest-paid YouTubers, according to Forbes. Logan Paul was pulled from a special YouTube project and lost elite status in the platform's Google Preferred ads program, accessible only to top creators, after posting a controversial video earlier this year. Paul filmed himself in a Japanese forest near what appeared to be a body hanging from a tree. YouTube said the images violated its policies and suspended him. Paul's account was marked with a "strike," which lasts for three months and can mean a loss of ad revenue from videos and from links to crowdfunding and merchandising websites. The now-23-year-old apologized for posting the insensitive content. Despite the turmoil, he ended up as YouTube's 10th highest earner of 2018. He was tied for fourth place last year. Despite criticism over making several anti-Semitic and racist videos in 2017, PewDiePie still made the list of YouTube's top earners in 2018. He dropped a few notches from last year, when he ranked No. 6. In February 2017, Disney and YouTube dropped the 27-year-old Swedish content creator, whose real name is Felix Kjellberg, after he posted a video of him laughing while two men held up a sign that said "death to all Jews." Later that year, he came under fire again and apologized for using the n-word during a live-stream. In 2018 he apologized for making fun of Demi Lovato's hospitalization. The YouTuber posted a meme that showed the "Sober" singer asking her mother for money to buy a burger, then turning around to buy heroin instead. He deleted the meme two days after Lovato was hospitalized for an apparent overdose. The most popular YouTuber in Ireland is the energetic and often foulmouthed video game commentator Jacksepticeye – whose real name is Sean McLaughlin, Forbes reports. The 28-year-old has broken into the mainstream and currently has over 20 million YouTube subscribers. Another international gamer has made the list of YouTube's highest paid stars, Forbes reports. Canadian Evan Fong – aka VanossGaming – plays mainstream games like Call of Duty and Assassin's Creed. The 26-year-old creates compilations of his video game commentary for his more than 23 million subscribers. Adding to the legion of gamers on the highest-paid list is American YouTube star Markiplier. The 29-year-old, whose real name is Mark Edward Fischbach, is known for his "Let's Play" videos, in which he provides on-screen commentary to games as he plays them, Inside Edition reported. Markiplier appeared on Jimmy Kimmel Live in 2014 to show the world what he does. Star first gained fame on MySpace and joined YouTube in 2006, sharing homemade music videos and makeup tutorials. The 33-year-old has since has become a makeup mogul and launched Jeffree Star cosmetics, which sells $100 million worth of products annually, Forbes reports. The #Alien collection and palette are NOW live!!!!!!!!  link in my bio!!!!! Daniel Middelton was last year's top-earner on YouTube, Forbes reports. The British gamer not only plays on-camera for his more than 20 million subscribers, but he also makes money on his tour and merchandise line, according to Forbes. Clocking in at over 36 million subscribers, the five-man sports crew known as Dude Perfect specializes in intricate trick shots, and made $20 million doing so, Forbes reports. Their "ping pong trick shots" and "real-life trick shots," in which they turn everyday activities into complex maneuvers, are among their most popular videos. The younger brother of controversial YouTuber Logan Paul, this 21-year-old is also on the list of top social media influencers. Jake Paul became popular for his role as Dirk on the Disney Channel series "Bizaardvark." He is also well-known for his YouTube channel, which has over 17 million subscribers. In August, more than 800,000 people shelled out $10 each to a watch a pay-per-view boxing match on YouTube in which Paul went head-to-head with fellow YouTuber KSI, CBS Sports reports. Neither star is a professional boxer. The No. 1 earner on YouTube this year is not your average millionaire — far from it. He's a 7-year-old boy named Ryan who reviews toys for other kids. Last year, it was reported Ryan made $11 million from his YouTube channel, coming in at number 8 on Forbes' 2017 list, but the toy critic is moving on up. His YouTube channel has attracted a huge following of parents and children who watch Ryan test out new toys and share his thoughts on them. Ryan, whose last name has not been made public, first started reviewing toys in 2015 when he was just 4 years old. On his channel, Ryan's parents write: "He loves Cars, Trains, Thomas and friends, Lego, Superheroes, Disney toys, open surprise eggs, play doh, Pixar Disney cars, Disney Planes, monster trucks, minions, playtime at the fun, family fun adventure and so much more!" Ryan's family says the child star was inspired by watching other kids and programs on YouTube and wanted to join the fun. His most-watch video to date featured huge Easter eggs and a bouncy house, and has amassed over 1.6 billion views. His YouTube channel has over 25 billion views in total and 17 million subscribers. Forbes reports he now has his own line of collectibles selling at Walmart.